Warp Zone Futuristic Arena with Interactive Play System! 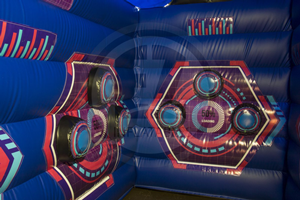 Inflatable Party Magic LLC Bounce House and Party Rentals features the inflatable Warp Zone Futuristic Arena, there are two sets of Interactive Play Systems inside. These are also referred to as IPS systems. Two opponents race against the clock and each other to see who can follow their own light pattern best. Inside the arena, it limited lighting which makes the lights show up well, but you have to be fast. Each side is divided and you can't see how well your competitor is doing until the Timer goes off and you come back to the scoreboard to see who is the best. Did you ever play the Simon light electronic game? The IPS is basically the live interactive version of that type of game. You have two separate sides inside the arena and each player takes a side. On your side, the lights will go off in a specific pattern and you will try to run and hit every one of those lights as they go off. On the other side, your competitor will also be getting the same pattern of lights to hit. The object of the game is to try and get more of the lights right than your competitor on the other side of the arena. You will not know how your competitor is doing until the buzzer goes off and the game is over. Then you will both come to the front of the arena to view the scoreboard and learn who the winner is. You have to be fast on your feet and in your mind, and pay very close attention to beat your opponent. The scoreboard doesn't lie so it will be obvious who is the best when time is up and the final score is posted. Several different game options are available. This is a game of skill, speed, and memory. 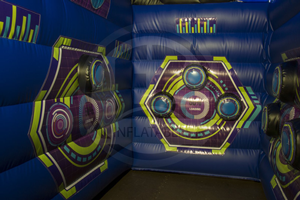 The Warp Zone Futuristic Arena is great for all ages and can be played indoor or outdoor. 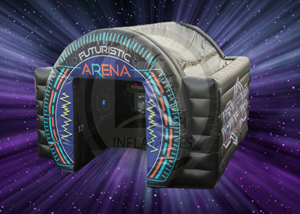 You can mix age group with this game as they are separated in the arena and the big kids can't hurt the smaller ones while playing this game. This inflatable is a 14ft. X 14ft and is 9.5ft. tall. Having a maximum height of 9.5ft. makes it a great option to move indoors as long as you have 10ft. ceilings. Weather will not affect the ability to play this game. Simply click on the add to cart button below, select your date and times, and follow the directions to complete your order and pay the deposit. If you need help completing your order or just don't like booking online, please do not hesitate to contact us. We are always available to assist our customers and would be glad to book your rental for you and take your deposit over the phone. Turn up the heat with this game! Below are the front, left, and right inside views of the arena.